Today, Rothschild, Schiff, Oppenheimer and Goldsmith are known as global finance capitalists and major conglomerates. Actually, they were all from the same place. That is the ghetto of Frankfurt. There is a street that draws an “arc” in the picture. I will enlarge it. 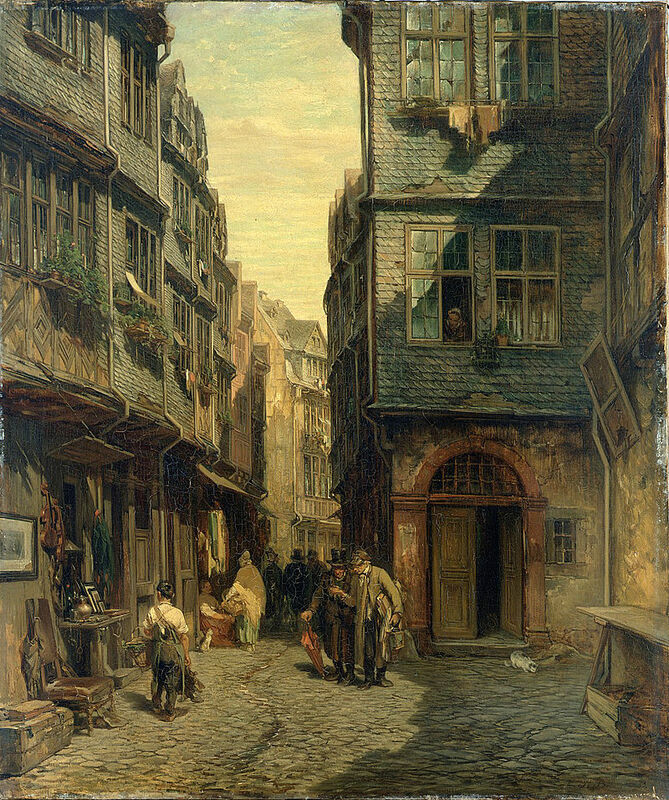 Narrow houses are densely packed on both sides of a street. We can see the faint letter of Juden (Jew). The inside of the “arc” was in contact with the outside of the wall. Moreover, gates are set up in the north and south of the street. This place is obviously a strange space compared to others. This is Frankfurt Ghetto to isolate the Jews and to live. At about the same time there were 26 Jewish ghettoes throughout Europe. Jews were so isolated in most parts of Europe that they were subject to discrimination and persecution. Moreover, the Catholic church ordered the creation of the ghetto. They persecuted the Jews seriously at the forefront. Takeo Osawa is one of Japan’s leading researchers in this field. He was the secretary general of Frankfurt’s Japanese international school until 2011. I will quote from Mr. Osawa’s work. In the middle of the Crusader era, the hoax of “sacred body blasphemy” (the Eucharist of Christ, blaspheming by stealing hostess) and “ceremonial murder” (kidnaping Christian infants for use in Jewish rituals) It came to be accepted by Europeans to. These are also the greatest reasons for the persecution of the Jews from the Middle Ages to modern times. Persecution of Jews by Christians began in the days of the Roman Empire. Due to some kind of collective psychology, which became even worse since the 11th century. Descriptions of “sacred body blasphemy” and “Ceremonial Murder” are extremely scary. In short, the European people at the time believed, “Jews are deadly sins who killed hrist, and horrible people who are performing demonic acts in shadows”. So people had prejudice that “Jews are not humans”. After that prejudice lasted hundreds of years, an example Holocaust occurred on the extension line of that discrimination. Subsequently, I also quote from the Japanese version of Wikipedia “Frankfurt Ghetto”, but the majority of the sources are also Mr. Osawa. 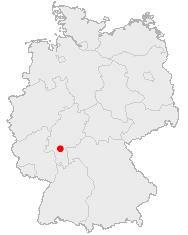 It is around 1150 that the existence of Jews is first confirmed in Frankfurt on record . 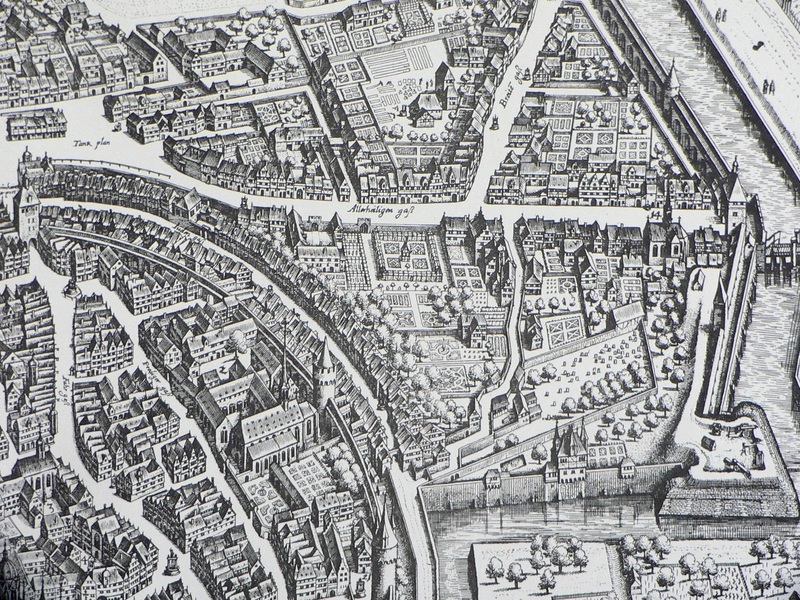 In May 1241, the cause was not well understood, but the Jewish quarter was attacked and massacred by Christians. As a result, the Frankfurt-Jews were once destroyed. 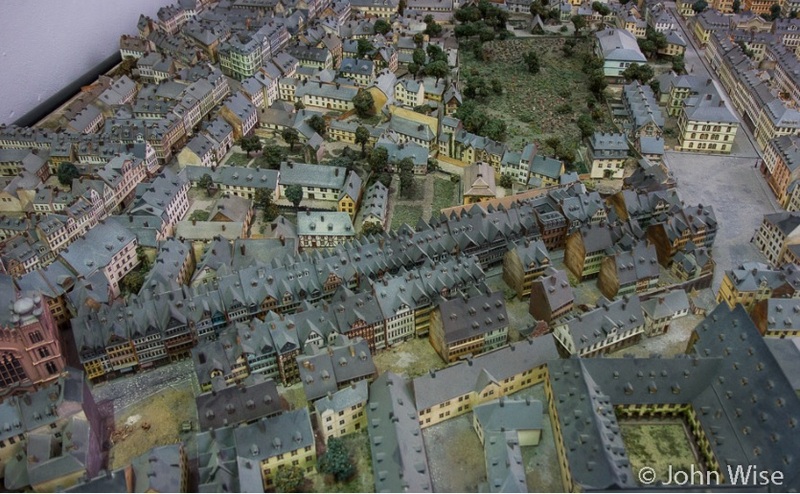 By around 1255 the Jews gathered again in Frankfurt and reconstructed the Jewish quarter south of the cathedral. Above is a horrible thing written. In this way, something triggered, the Jews were often attacked and massacred by ignorant Christians. In the period from 1348 to 1349, Europe was attacked by the largest plague ever in which one third of the population died. Due to the low Jewish mortality rate, the hoax saying “Jews poisoned wells” rapidly spread throughout Europe. As a result, the Jewish genocide was particularly blown up in the Holy Roman Empire (Germany) . 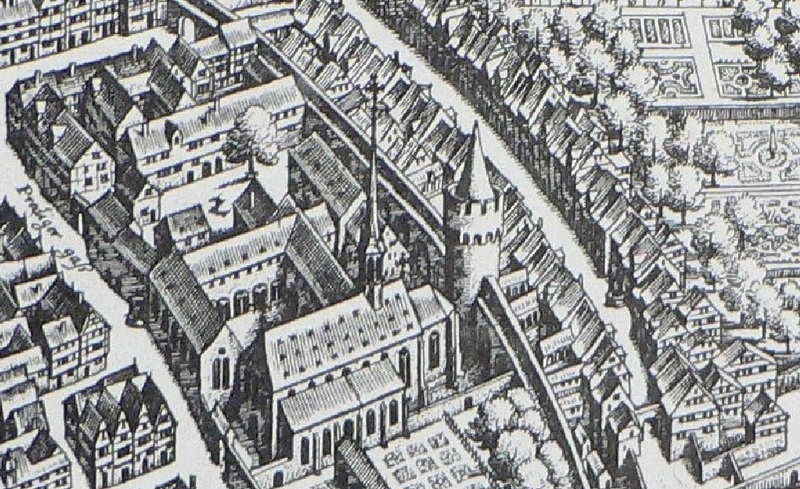 Even in Frankfurt the infection of the plague began, and a group of Flagellants appeared from the upper stream of the Main river, attacking the Jewish quarter in Frankfurt. Frankfurt citizens repel them, but in the end the Jewish quarters were arsonized, slaughtered, and the Frankfurt Jews were destroyed again . 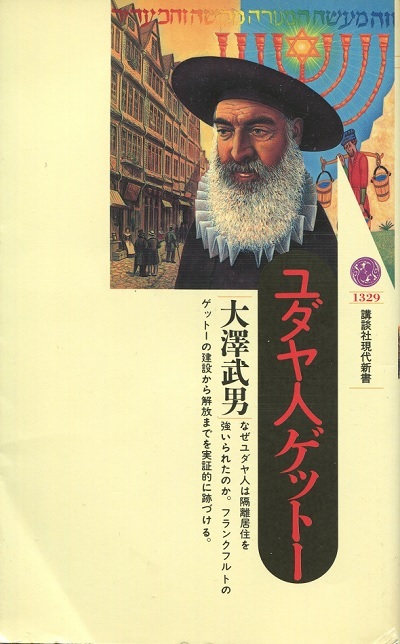 According to Mr. Osawa’s book, after this, from 1360 again Frankfurt began accepting Jews, but also Jews did not want to come too much. 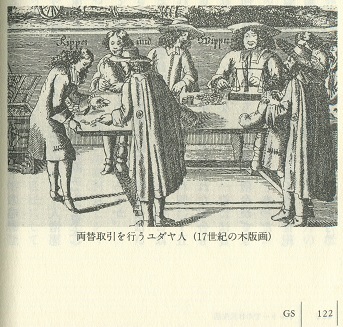 In 1440 it was said that it had decreased to only 60 to 75 people. At that time, the Jews were scattered almost all over Europe. 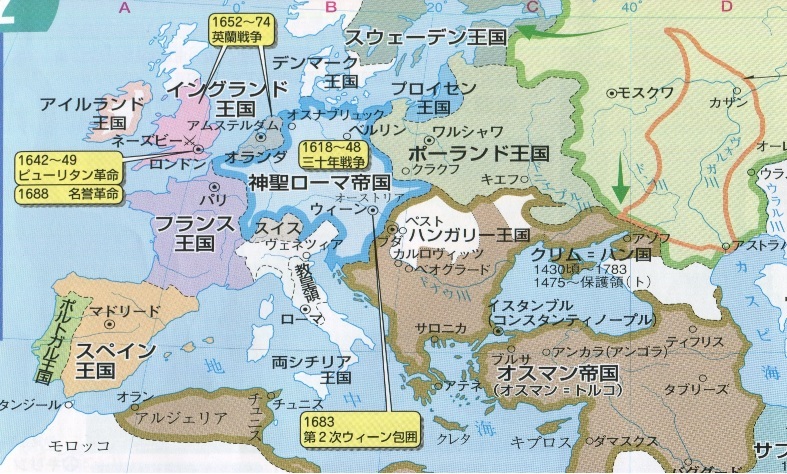 They were not only in the Holy Roman Empire, but also in France and Poland next door. And the Jews repeatedly retreated and moved, traveling around the country in search of even better conditioned cities. 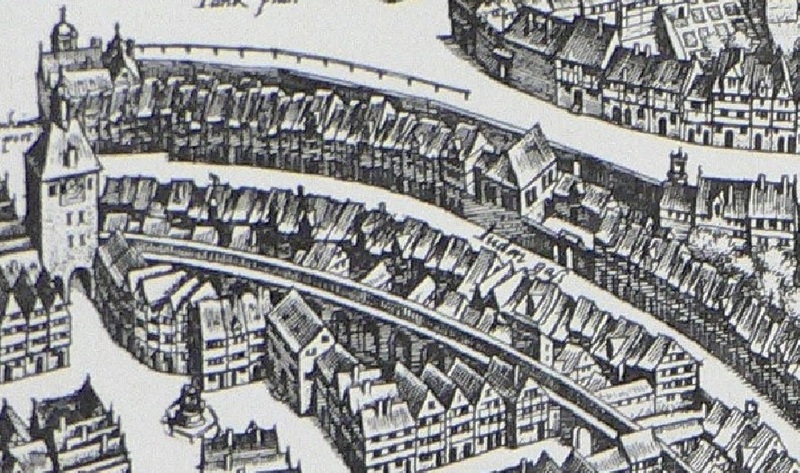 In the 16th century, the residents of Frankfurt Ghetto will also gradually increase. In the latter half of the 16th century it was around 2000 people. In the early 17th century it was about 2,700 people, and in the early 18th century, about 3,000 Jews were living. This was an increase due to immigration rather than natural increase. About 500 households, about 3 thousand people in the peak period. 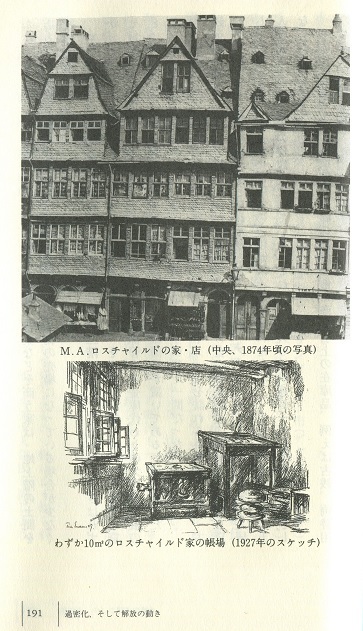 Matthäus Merian’s copperplate painting is about this time he drew. It is said that all the buildings were almost in a state of being soiled as people living only in narrow streets. Moreover, since it is wooden, fire will spread out quickly as it happens. As many people were living in a narrow town, every building was packed. Moreover, because the house is made of wood, fire spread quickly. Although I do not know clearly, Rothschild, Schiff, Oppenheimer and Goldsmith family are not residents from the original, it seems to be an immigrant group since the 16th century. However, the people of the ghetto were all members of the same village, like relatives. Actually, these four families do not know where their ancestors are connected. The fact that it was isolated from the surroundings and persecuted was also a factor that brought them together. Big bankers were born from this small town where wooden houses gathered closely. 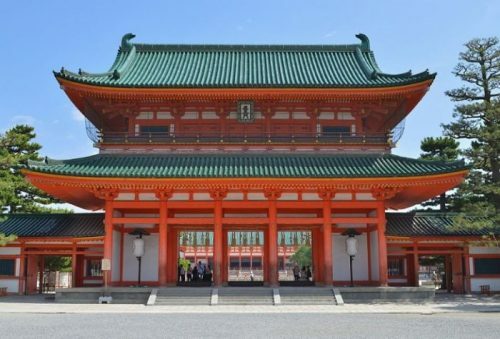 It had a social religious background of the time. It was natural that the Jews who had to live in the money lending business in an unstable state tried to acquire interests as advantageously as possible. In this way, successful people in the financial industry began to appear from Frankfurt Ghetto. The initial successful person is Oppenheimer. In the 17th century, Samuel Oppenheimer went up to the court Jews of the Holy Roman Emperor Leopold I (reigned from 1658 to 1705). The Oppenheimer family fell within the center of the Imperial Jewish community alongside the Samson Wertheimer in Vienna. At that time, the Ottoman Empire was closing to Vienna. The two Jewish bankers supported the war cost against the Ottomans to the emperor and got various returns. From 1757 to 1763, Samuel’s grandson Jacob Oppenheimer hired Mayer Amschel Rothschild as an able apprentice. He is the first Rothschild. He later went on to the court Jews of Landgrafschaft Hessen-Kassel, one of the 300 national states in that Holy Roman Empire. So The Oppenheimer family may be “higher rank” than the Rothschild family. 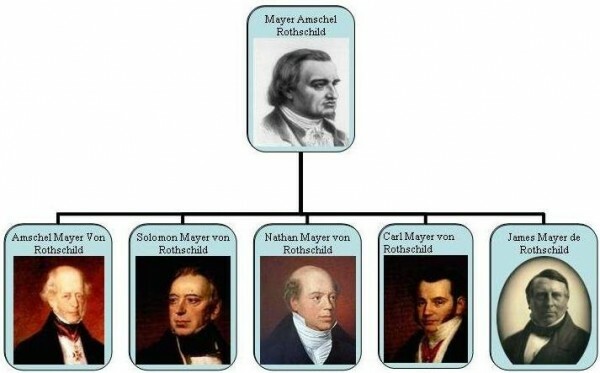 I imagine that Mayer Rothschild received loans from Oppenheimer to become independent as a merchant. It is an act that the successful Jews do well to make interest-free loans to talented young people. Moreover, this is the teaching of the Old Testament. Jews are never in a slavery relationship by lending and borrowing money. Actually there are 5 to 6 reasons why the first Rothschild and sons got rich in Europe in a short period of time, but I will talk about it later. Well, simply speaking, thanks to Napoleon’s involvement in the whole of Europe in the war back then. Anyway, from this ghetto, outstanding big bankers such as Oppenheimer, Goldsmith, Rothschild, Schiff and so on were born, and eventually they moved the West and the world. Therefore it seems that they were relatives among hundreds of years. There was a Jew who succeeded as a banker in any ghetto in Europe. For example, Warburg of Hamburg. However, Warburg and other court Jews in various places will be merged into this Frankfurt group. And with loans and support by their Frankfurt group, other child conglomerates are born one after another. Morgan and Rockefeller are one of them. I think I understand why the European Central Bank is in Frankfurt. And with the financing and support of the Frankfurt group, other child conglomerates were born one after another. Morgan and Rockefeller are one of them. 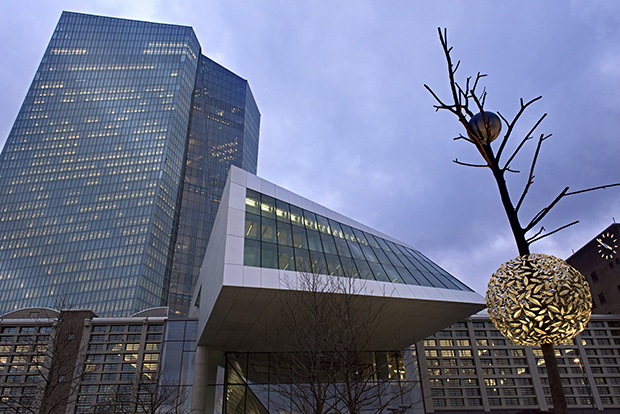 I think that you understand why the European Central Bank is in Frankfurt. It is a common misunderstanding, but it is not because “one clan” separately controls the world. Such a thing can not be done unless it is a tyranny country. Even even a tyrant state, clan rule is difficult. Both Rothschild and Rockefeller are members of a huge organization. Because they are uniting through each other’s marriage, family lines do not make much sense as they used to be. Also, the so-called “conspiracy of Judea” is an unavoidable survival strategy of the Jewish people who were discriminated and persecuted, and it was a liberation struggle. The family who fought for the Jews at the forefront was Rothschild. They have pride as Jews and have struggled for the liberation of the Jews. This “Human Rothschild” perspective is also indispensable. Finally, I would like to introduce the episode of Meyer Amchel’s wife Gutle. She gave birth to nineteen children. Ten of them grew up. Even after his sons succeeded as a banker, she continued to live in a small house in the ghetto for her entire life. And she met with children and grandson who visited as a Great mother and kept living until 1849 much longer than my husband. Do not you see such a story often? In 1773, the first Rothschild held a secret meeting in Frankfurt. In order to keep absolute control over the whole world in hand, they formulated the “World Revolutionary Action Plan” consisting of “25 action plans”. He said, “Give me the right to issue and control the currency of the country, so that no matter who will make the law,” he said. 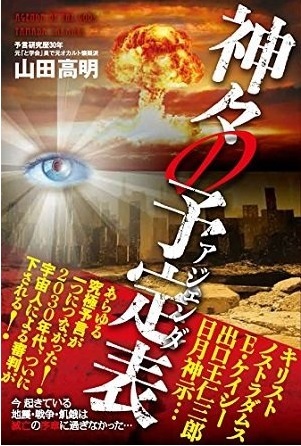 This kind of story is diffusing considerably, but it is impossible. Rothschild of this time was only a single merchant who sold antiques to aristocrats and rich people, and even was not a powerful person of Jewish society.